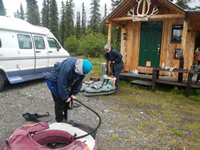 The float tubes were ready to be inflated and the big rainbows & grayling were just hanging out in the lake waiting for us when we arrived at our cozy cabin near Cantwell, AK. 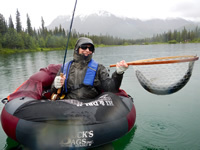 It didn't take long to have a lesson in putting on the swim fins and getting in and out of the tube, and we launched in the rain for our first encounter with these very special fish. It was cold and wet with new snow blanketing the surrounding mountains. Eileen was the first to hook up about ten minutes after she'd backed into the lake, and she did a masterful job of playing her 26 inch prize. He zinged and zoomed around the lake making one deep dive after the other just to make sure she was paying attention. Finally he succumbed to the pressure of the 8-wt rod and allowed himself to be netted. Wow, he was a beauty! A quick picture and I showed her how to release him by paddling with just one foot to make the tube move around in a circle so she could create some oxygen for him. It didn't take long for him to thrust himself out of her hands. Both Pamela, a neophyte fly fisher, and Sandra, an experienced angler also had fish within a short time, catching both rainbows and grayling as we circled the lake. The fish were very cooperative. We could look down into the water and see their huge, dark bodies swimming just below our flippers. The cold, wet atmosphere finally sent us back to the cabin for a glass of wine before dinner where we enjoyed rotisserie chicken, corn on the cob, and a delicious broccoli salad. After just a 34 degree night, and continuing snow on the mountains, it was raining even harder the next morning, so just Pamela and I headed out during the early part of the day, having put on all of the warm clothes we had brought. 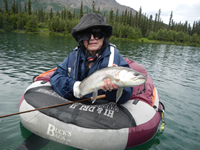 Now Pamela was feeling much more confident about her hooking and landing skills, so she reacted quickly to the large tug on her fly that nearly doubled-over her rod. This was a fish that actually pulled her tube around as she tried to manage it. She kept asking when he was going to give up. I knew that this was a huge fish, so I just urged her to keep the tension on him and let him run. He was definitely in control. The measuring tape showed about 28 inches when we finally brought the fish to the net, after about six tries. His huge tail flapped in the breeze above the wood rim. Putting her hands in the freezing water, Pamela paddled around with him while he revived, and then showed me her blue fingers after he was gone. She hooked and landed several more large fishing that morning, and so did I. We each had some gorgeous grayling attack the flies as well. Although we were actually freezing, it was hard to get out of the water. We were so cold we could hardly paddle. We spent much of the afternoon checking e-mail and going for a walk while we waited for the temperature to rise. That night we indulged in home-made lasagna and a great salad. Our third day dawned bright and sunny, and we were off for the lake as fast as we could get our waders on. While the water was still pretty cold, at least the ambient air temperature somewhat made up for it. On the way out to the middle of the lake we encountered beautifully colored grayling. This time it was Sandy that got us started with the big rainbows, however. She had switched to a black bead-head bunny fly from the olive woolly buggers the rest of us were using and landed a fish in the 24-inch range. Once again, the net was just barely adequate. I'd bought a new Brodin float tube landing net, but it was just barely a match for these huge fish. Eileen and Pamela were also both successful in landing other fish the same size as well as many smaller fish that entertained us with their eagerness. We grilled hamburgers for dinner after taking a walk around the lake on the new water-side trail. Our last day saw us driving up the western end of the Denali Hiway towards Brushkana Creek where we saw a moose and her calf just walking along the road. 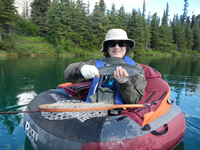 We fished for grayling so everyone could experience river fishing as well as lake fishing. The water was still very high after all the rain, but the drive was beautiful, and we still caught some fish. The bugs were absolutely horrendous, however, and we couldn't take off our head-nets for even a second. Our 2013 trip was so great that I knew that we had to return here this year. 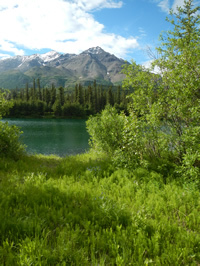 Adventure Denali's fish were stocked in this lake many years ago, by Kirk Martakis, the owner, who has been feeding them ever since. We watched Kirk's son, Tanner, and one of the employees feed the fish from a small boat that they row around the lake as they throw out the pellets. The fish absolutely go nuts! 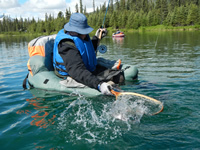 Kirk now operates his lake for paid, catch and release day-fishing by guests from the various hotels & lodges at nearby Denali National Park and for guests staying at his cabins. Kirk has been enhancing the small creek running between this lake and one right nearby to provide better spawning habitat for the fish, and this spring, for the first time, he observed lots of spawners. We also provided some proof that his efforts were paying off by catching lots of fish of various sizes, from 8 inches to 28 inches. What more could you ask?? Sure was hard to say good bye, but we have another trip scheduled August 21-24 so we'll get to visit these behemoth fish one more time before the summer is over. There's still one spot left in that trip, if you want to go along!